PDF is probably the most portable document format. Nearly all operating systems has a built-in tool to view PDF documents. PDF is the safest way if you want to send a document to your business partners or customers without needing to worry that they won’t be able to view the document you sent. PDF itself stands for Portable Document Format. If your job often requires you to work with PDF document then you need a decent tool to work with. Have you heard about CleverDF? Just like the name suggests, CleverPDF is a clever tool to deal with PDF files. 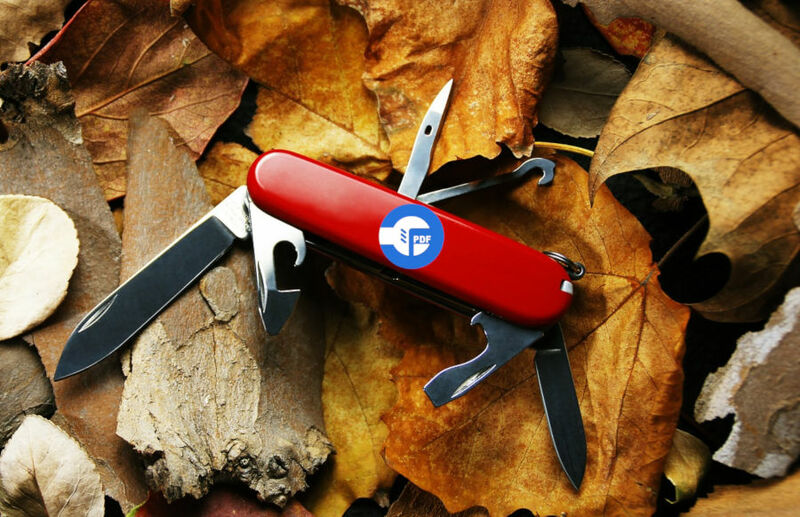 It is like a Swiss Army knife in which you can do lots of things using a single tool. You can use CleverPDF as a converting tool to convert a raw document formats like DOCX, PPTX, XLSX to PDF and vice versa. In addition, CleverPDF can also be used as a PDF utility tool in which you can do such things as merging two or more PDF files, adding a watermark, or adding an encryption to a PDF file. As mentioned earlier above, CleverPDF can be used as both PDF converting tool and PDF utility tool. This tool is capable of converting popular raw document formats like DOCX, PPTX and XLSX to a PDF document. Conversely, you can also convert a PDF file into a raw document format in case you need to edit it. In addition to document formats like mentioned, CleverPDF can also convert an image into a PDF. Following are how you can use CleverPDF as a PDF converting tool. In addition to converting documents and image, CleverPDF can also be used to perform other tasks. For instance, you can add a watermark to your PDF document. 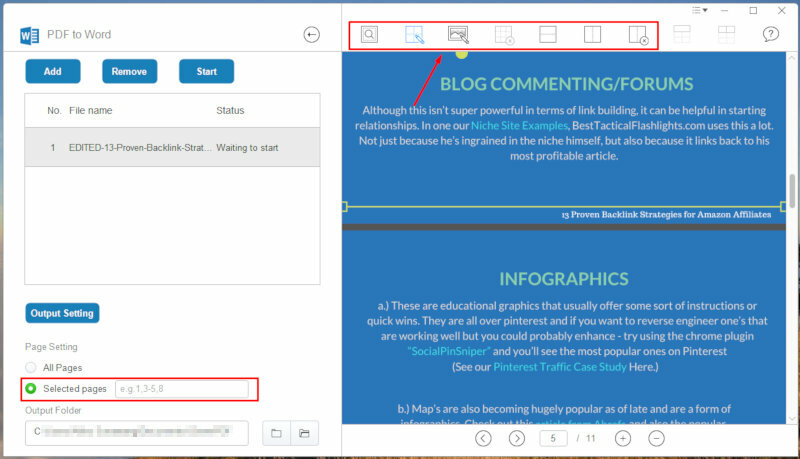 When adding a watermark, you can set the transparency level as well as the position of the watermark. Or, you can also simplify several PDF documents (merge) into a single file using this tool. This feature is pretty handy in some cases. For instance, you can merge the receipt files of the bank transactions as a monthly report to your boss. You can also encrypt a PDF file to prevent it from being open by the wrong hands. Following are several tasks you can do with CleverPDF other than converting documents. CleverPDF itself supports cloud storage integration. When adding a document to convert, you can choose the file from your computer or import it from from Google Drive or Dropbox. Similarly, this tool also allows you directly save the converted document to either Dropbox or Google Drive. The cool thing about CleverPDF is that you can use it for free (completely free) without needing to create any account. If you want to use this tool, you can simply visit its website and choose what you want to do. Whether you want to convert a PDF to Word, merging PDF files, adding watermark and so on. It takes only about three or four clicks to convert a PDF into other formats or vice versa. If you have a big concern about only privacy, then CleverPDF the right tool for you. Not just because this tool does’t ask for your personal information (email), but your file will be deleted after 30 minutes from the time you converted it. If you think that 30 minutes is too long, you can also delete your file right away after you have download it. There is a delete button offered as well. CleverPDF itself is an online-based tool, meaning that you can use it no matter the operating system you use. But, you will need to have an internet connection every time want to use this tool. It is also possible if you wan to use CleverPDF without internet connection since it also offers a desktop version. At the time of writing, the desktop version of CleverPDF is only available for Windows. Is it free? Unfortunately not. You need to spend $39.99 to use the full version of CleverPDF. Actually, you can also use the desktop version of CleverPDF for free, but as PDF creator only. The front page of the desktop version and the web version of CleverPDF are precisely the same. The desktop version of CleverPDF offers more options than the web version. For instance, if you want to convert a PDF file into a Word file, you can select which pages you want to convert. You can also mark image area or adding either a horizontal or vertical line before starting to convert. CleverPDF is great tool to work with PDF files. You can use it as a PDF converting tool to convert a raw document format into a PDF file and vice versa. CleverPDF supports a wide range of popular document formats. From Word, Excel, PowerPoint to iWork. It also supports image. In addition as a PDF converting tool, you can also use CleverPDF as a PDF utility tool to merge several PDF files into a single file, encrypt a PDF file or adding a watermark and so on. CleverPDF has a very clean user interface. It is available for web and desktop (Windows). 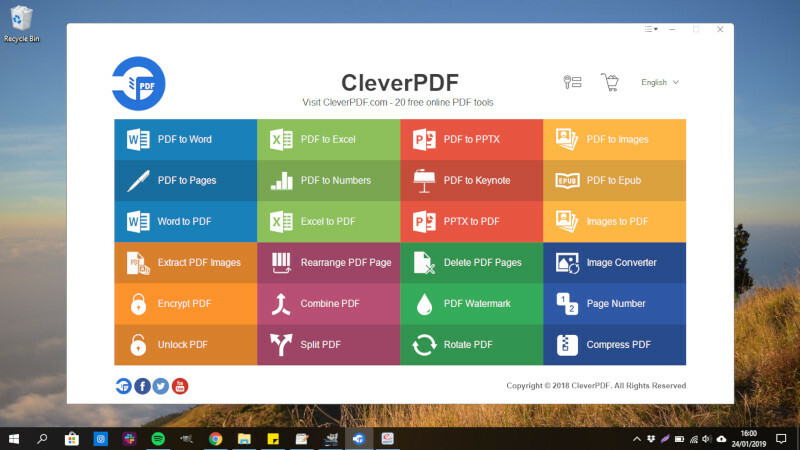 While you can use the web version of CleverPDF for free without needing to create an account, the desktop version of this tool offers more options. Also, the desktop version of CleverPDF doesn’t require an internet connection to work.